Welcome to week ONE HUNDRED AND THIRTY-FIVE of Saturday Centus. 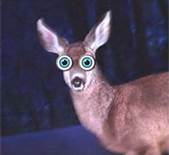 The prompt this week is, "I finally understood the phrase 'a deer in the headlights' "
Number of words: Up to 110 (including the 110 words of the prompt). Please, you can now follow-me this blog. I am so working on a post in my head at the moment- With Thanksgiving, work and today- well I'm off to dress as a Super-Pirate-Princess for my 3 year old grandson's Happy Super-Hero Birthday Party this afternoon. I'll be back with my centus after I return! See you soon Jenny! Hi Jenny- the Super-Hero party was a success-and I'm still breathing! Hahahahaha! I really like this prompt and your cute little headlighted deer! Sorry I missed it, Jenny. I haven't posted in almost a week. It was just too crazy with all my company here.